Stay as long as you like. Come back often. Comments are always appreciated. This site uses referral links, at no cost to you, as described in the disclosure policy on my sidebar. 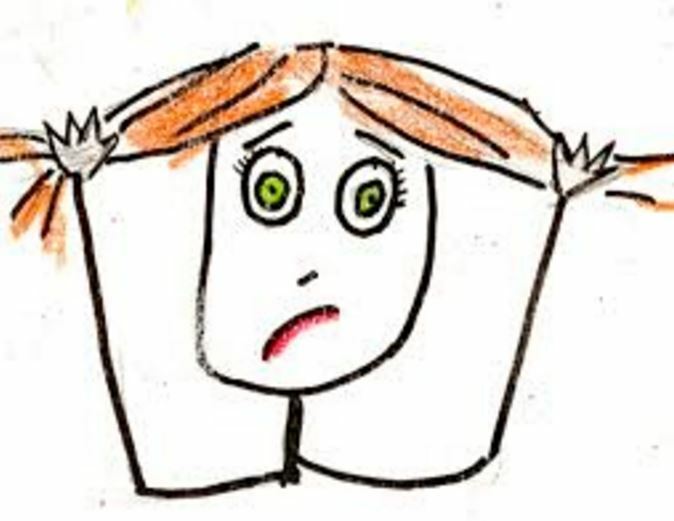 To visit the page for a specific card, pause the slide show (II) and type the card title in the search bar to the right. 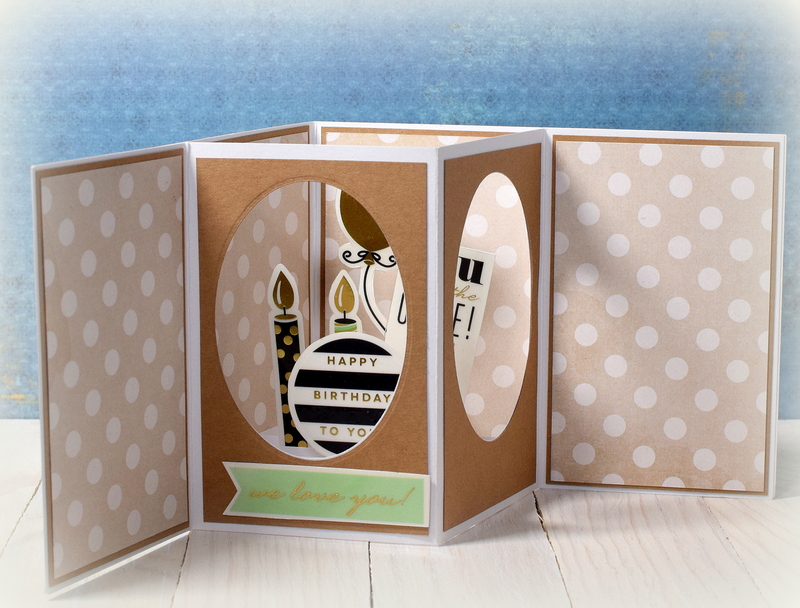 This card was made for a StampTV challenge (several years ago) where we were to use Polka Dots and black, white, and/or gray with one other color. 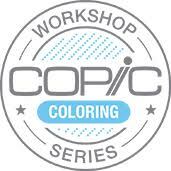 My additional color was tattered rose (peach). 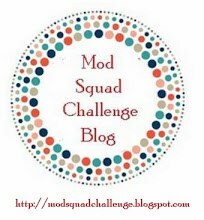 I started with a piece of Basic Grey polka dotted paper (the back side of “Grapevine”) and added a bunch of images to create my own patterned paper. 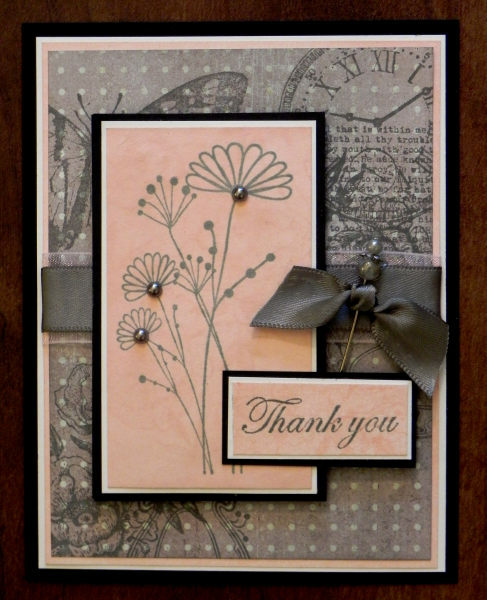 The stamps I used for the background were all from the Gina K Designs and came from the following sets: If I Had a Flower, Sympathy Label, Hope is Faith, Time, and Vintage Backgrounds (all retired?). I used Memento Gray Flannel ink to stamp the images and then lightly sponged Memento London Fog ink over the whole thing. For the focal image and greeting panels, I inked white card stock with Tim Holtz Tattered Rose distress ink. (I then stamped the floral image from If I Had a Flower randomly all over these panels in Tattered Rose ink to try to create a subtle background, but the ink soaked right in and you can hardly see it! This was made pre-MISTI, so I couldn’t re-stamp the images to make them darker.) Next, I stamped my focal image and sentiment using Memento Gray Flannel ink. The stamps used were from GKD Hopeful Flowers and Thank You duo (both retired?). 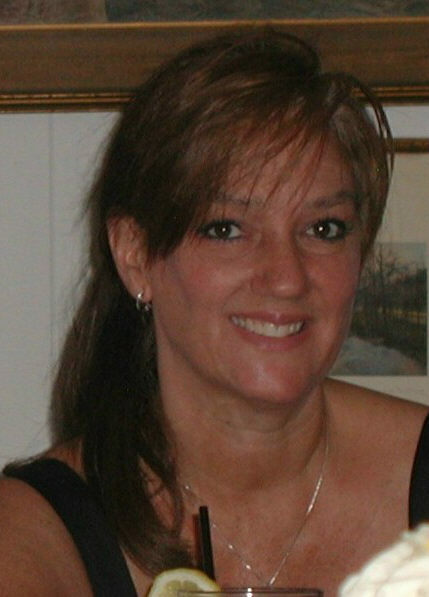 Satin and sheer ribbon, a hat pin, and some self-sticking gray pearls were added. I created a mat for the gray background panel by sponging the Tattered Rose ink on white card stock. White and black mats were also used. This project was originally posted in my StampTV gallery on August 13, 2014. 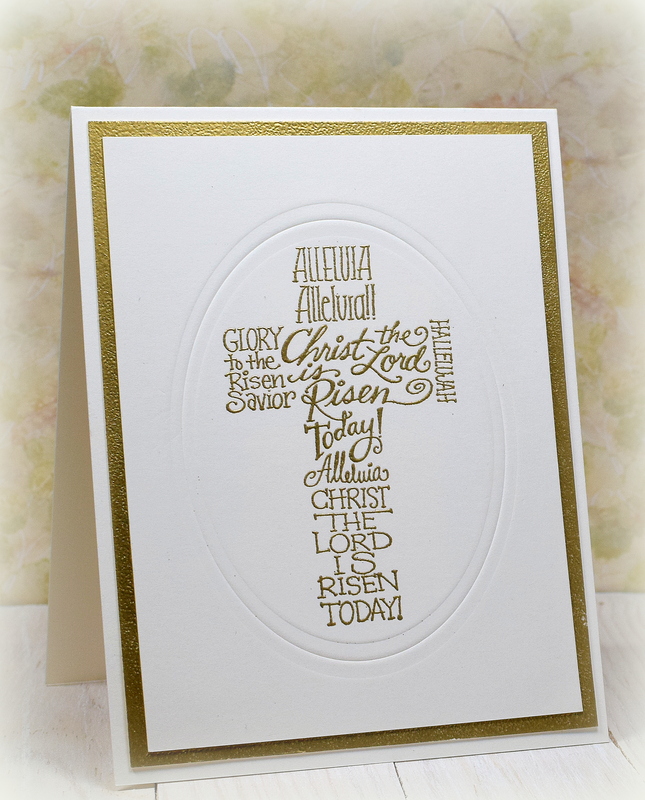 This CAS card features a stamp called “Easter Cross” by Stampendous. 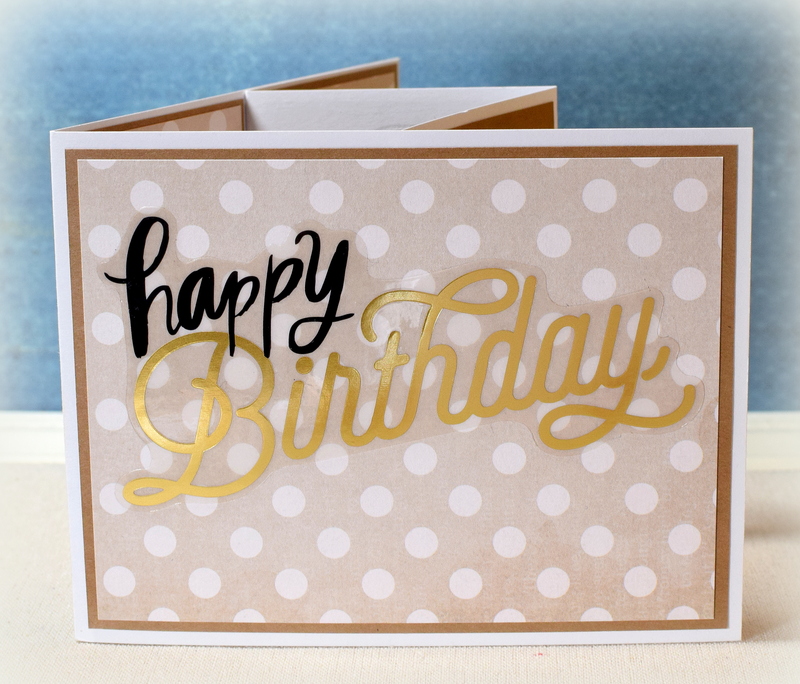 The image was embossed with gold embossing powder on GKD Ivory card stock. The mat was also embossed in gold (around the edges) before adhering to the back of the front panel. I used a Spellbinders oval die to emboss the frame around the cross. 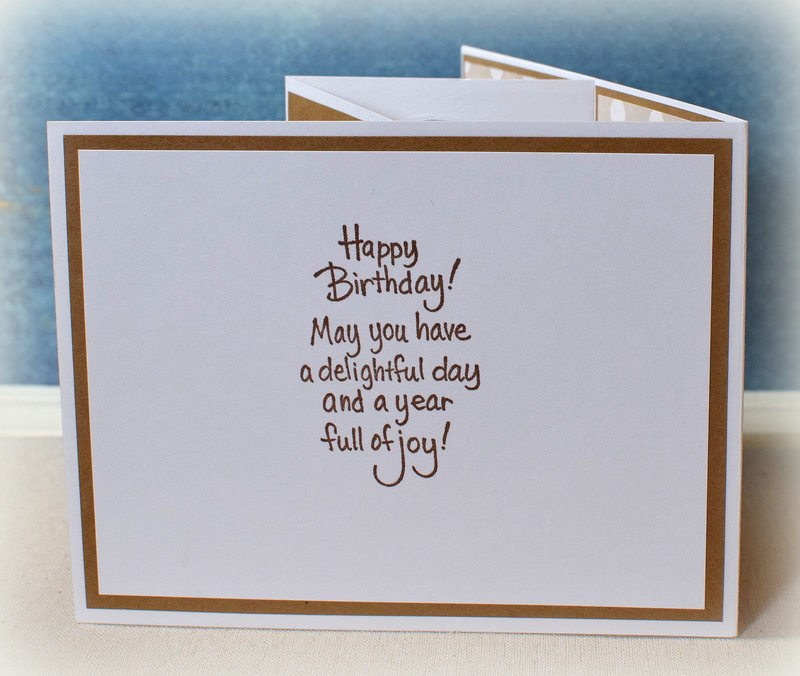 This card was originally posted in my StampTV gallery May 4, 2014. 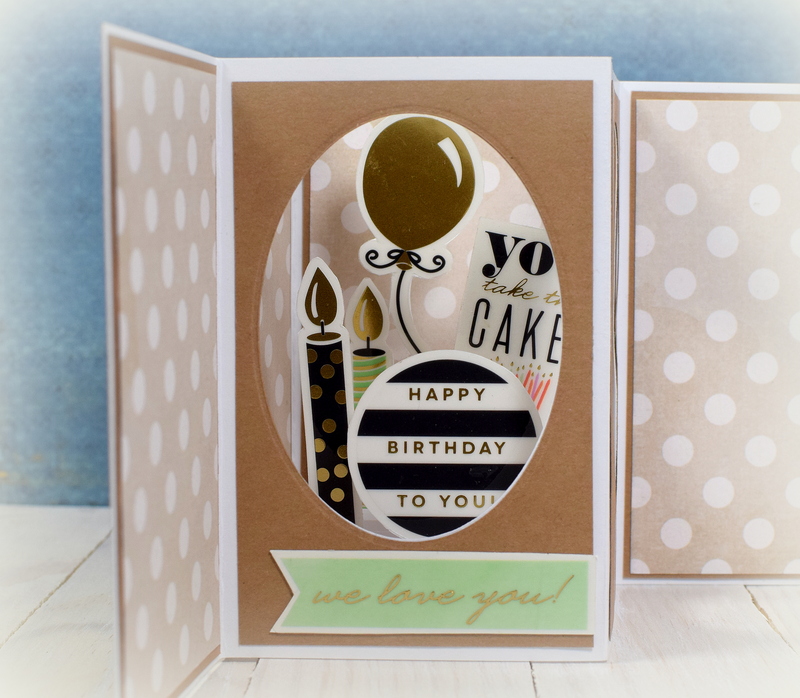 I really liked these dies when I saw them and envisioned the card in my mind that I planned to create with them, and then I had a bit of trouble trying to fit all the actual die cuts on the card front – lol! 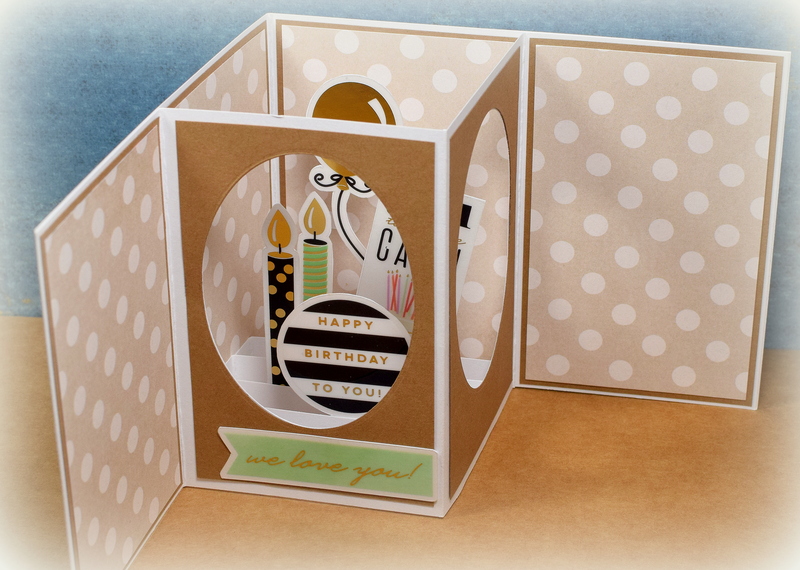 Luckily, die cuts are moveable so I played around with the placement until I came up with something that worked. 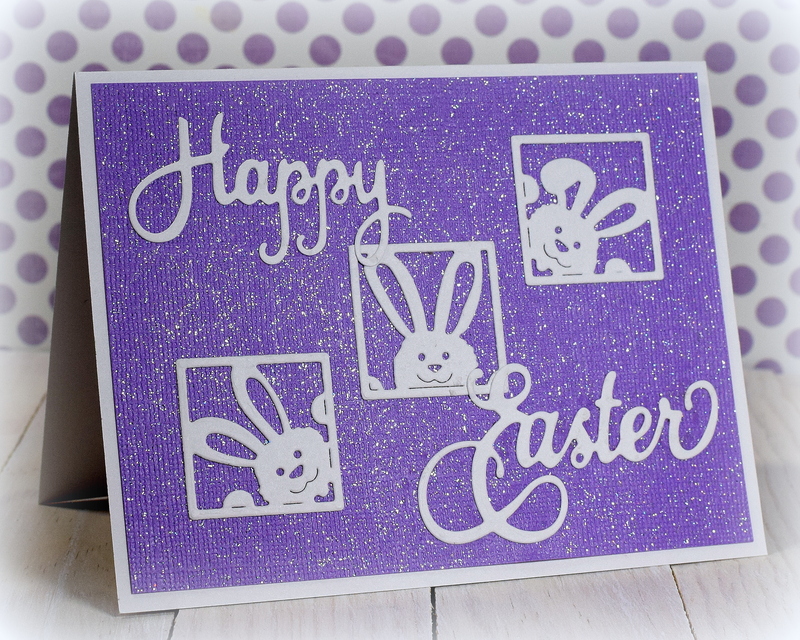 The textured, purple card stock is called “Elegance” by core’dinations and has glitter on it so adhering the die cuts required glue (and not tape). 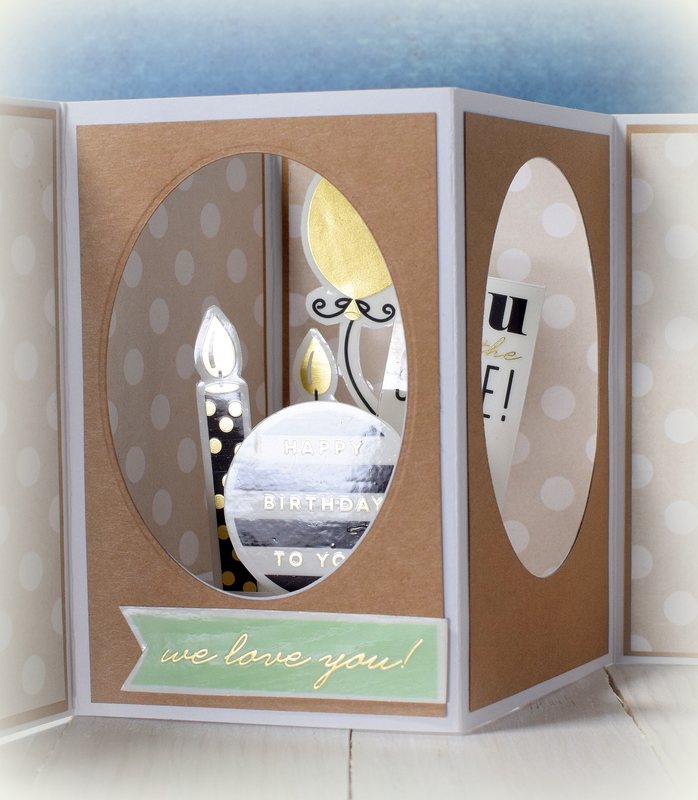 You can see how I attached these intricate die cuts HERE. For this project, I used Art Institute Glitter Designer Glue. 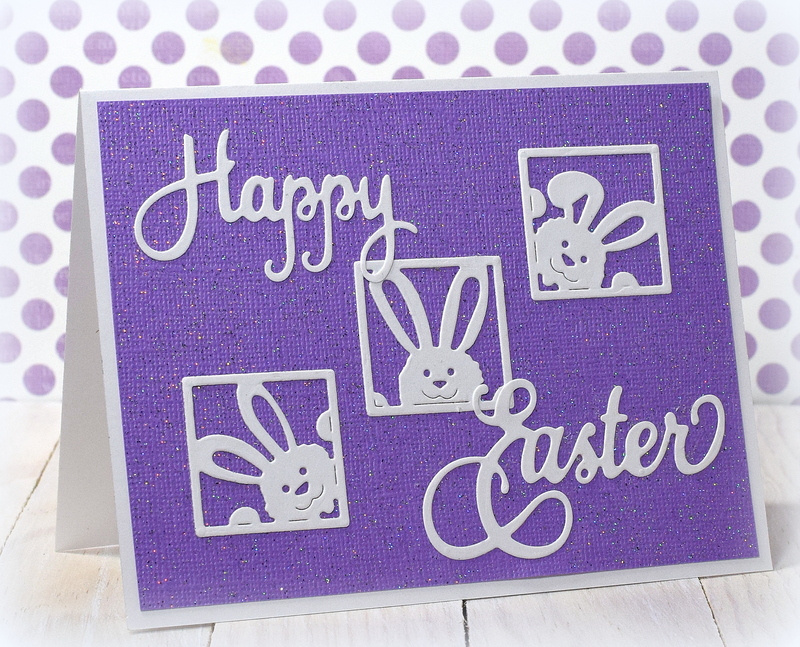 I think the “Peeking Bunny Squares” by Frantic Stamper are so cute, and I love the font for “Happy Easter” by Impression Obsession!